~ "Sharing memories from the past and making new ones for the future!" 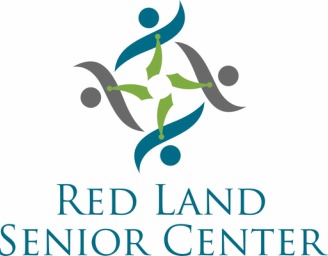 The Red Land Senior Center was established in April of 1974 and functioned as a Nutrition Site for seniors sixty years of age and older. The service was designed to provide one hot meal per day, five days per week. Emphasis was placed on serving those with the greatest economic and social needs with the objective of reducing isolation. The senior center was based in Lewisberry and seven seniors attended on opening day. At the end of the first year of service, the program had grown to approximately fifteen members. At that time, Lutheran Social Services, Inc. from York administered the program. Two years later, the York County Area Agency on Aging was established, and administration was turned over to this agency. The Red Land Senior Center flourished and by 1979 had outgrown its original home. Funds became available through Title V of the Older Americans Act for renovation projects. Thanks to these funds, an application was submitted and approved to renovate the building. The new addition doubled the size of the building, allowing more space for programming and activities. Once again, participation increased and the pattern of growth continued. In 1982, the York County Area Agency on Aging encouraged the senior center to establish a board of directors and file Articles of Incorporation. On March 8, 1982, the senior center was established as a non-profit corporation. The mission was to maintain and operate a senior citizens center to serve as a meeting place for persons over the age of 60 with the aim of facilitating their social, emotional, and physical well-being by the establishment and support of community based services and activities. Thirty years later, this continues to be the mission of the senior center. Since then, the Red Land Senior Center has contracted directly with the York County Area Agency on Aging to provide services to our local seniors. 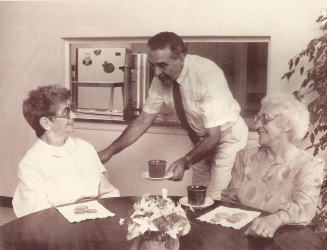 By the end of the 1980’s, the center had grown in size to 125 active members and had an active Home Delivered Meals program of approximately 40 homebound individuals. In 1989, it became ever apparent that the center’s housing location in Lewisberry was no longer suitable to meet the needs of a growing senior population. Moreover, the facility lacked the necessary space to provide simultaneous programs. In the summer of 1990, members of the Newberry Business Association approached center officials with an idea that would not only solve the space problem but would move the center to a modern facility located within the former food court of a nearby mall. A contract was signed on May 18, 1991 after several months of careful negotiations between Red Land Senior Center, the Newberry Business Association, and Massachusetts Mutual Life Insurance Company, who were the owners of the mall. Senior center operations were relocated to the Newberry Commons Mall in Etters during the summer of 1991. An immediate surge in membership occurred. In addition to new programs offered, the center also opened its very own thrift shop which operated during senior center hours and was open to both center members and the public. The thrift shop obtained merchandise through donations and in turn sold the items to create an everyday, year round fundraiser. The center’s location within the mall was convenient and offered much needed independence to many members. For the first time, members had nearby access to shopping stores, a drug store, banks, doctors’ offices, dentists, etc. After sixteen years at the Newberry Commons, mall ownership asked the senior center to leave so that it could make room for office space for another local company. At the same time, funds received from the York County Area Agency on Aging were dramatically cut. Center officials went in search of a suitable location to serve older adults within the community. In 2007, a five-year lease was worked out between the senior center and the Parkville Bible Church. The church had previously operated a Christian school which had since closed several years prior and the building had remained vacant. During this time, the founding Executive Director Phyllis Beaver and Assistant Director Wanda Shaffer both made the decision to retire. This would be the first major personnel change in the center’s thirty three year history. Jeff Williams was then brought in as an interim director. Many renovations needed to be made to the former Parkville Christian Academy to bring the building up to code and accessible to the various programs that the senior center offered. During this time, the center was temporarily closed. Congregate meals were postponed and the home delivered meal service was divided between the Dillsburg Senior Center and the Northeastern Senior Center. After much anticipation, the center hosted its grand opening celebration in February of 2008. In April of this same year, a program assistant was hired to begin the process of transitioning into the Executive Director position as Jeff phased himself out. Jen Washburn made this transition in July of 2008 and has been with the center ever since. During this time, the York County Area Agency on Aging deemed the Red Land Senior Center a ‘satellite nutrition center’. Essentially, this meant that Red Land was only responsible for serving congregate meals and would only be funded for as such. The senior center felt its mission was not being fulfilled by only providing meals, so programming continued in spite of the funding cuts. In 2009, the Agency on Aging unveiled its plan to make funding incentive based. In 2010, all York County senior centers were required to achieve a minimum congregate meal average of 12 per day in order to retain their contract with the Agency. By 2010, senior center membership had grown to about 400 members. This minimum congregate meal average was consistently achieved and in some cases exceeded in which case, more funding was provided during these months. In 2011, the minimum number had been increased to 18. Once again, this benchmark was achieved and several times exceeded. Starting in June of 2012 this benchmark was increased to a minimum average of 24 and as of October of 2012 the benchmark was raised again to a 35 average. In mid-2010, the process of researching housing options for the senior center began in preparation of the 5 year lease with Parkville Bible Church expiring. In 2011, Wyndamere Heights Church offered a piece of the church’s land to build on. The offer had already been extended for some time to the Red Land Little League. Talks with the Little League and church commenced and in the process it was found that one large building could be constructed to serve both entities and more importantly the entire community. In June of 2012, the senior center moved into the Wyndamere Heights Church and now uses the fellowship hall for programming. A room was also made available so that the senior center could continue running a thrift shop. Residency within the church will occur both before and during construction of the new community building. New services and programs are always being added as part of the Red Land Senior Center’s diverse plan to help seniors remain independent and an active part of our community. We look forward to our continued growth!